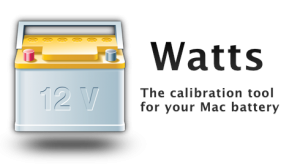 My good buddy Kyle pointed me in the direction of a great little app for OS X to manage your MacBook Pro battery. Its from Binary Tricks and its called Watts. This little app, which only costs $6.95 by the way, allows you to calibrate your battery through 5 easy steps. Various people out there on the intertubes suggest you calibrate your battery once a month to maximize its life. I’m on my second 17″ MacBook Pro battery after the first one suffered the infamous “Swollen Battery” problem almost 2 years ago. That said, I want to get as much out of this one before ponying up another $130 for a new battery. I’ve been using Watts now for about a month and so far I love it and highly recommend buying it. Speaking of new batteries, Other World Computing offers new 17″ MacBook Pro batteries from NuPower for only $99.99. They supposedly hold a longer charge and last much longer than those sold directly by Apple. I haven’t tried one yet though. They also sell Battery Charger/Conditioner devices for them. I’m not sure I’d pony up the cash for one of those though. This entry was posted in Apple, MacBook Pro on December 7, 2010 by bill.